A mysterious black car races out of a tunnel near the town of Santa Ynez, Utah. After ramming two bicyclers off of a bridge, it begins a campaign of hit and run murders throughout the town. 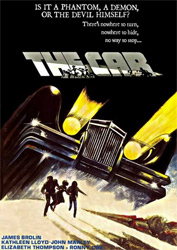 After the sheriff (John Marley) is killed, Captain Wade Parent (James Brolin) has to head up the efforts to stop The Car despite his numerous domestic problems. The Car appears to be driverless, indestructible and won’t cross onto the hallowed ground of a cemetery. This movie was a late night TV staple for years when I was younger. I’ve never understood why it gets poor reviews from critics. If you can get past the central premise it has a lot of strengths. The Car is a great looking monster, there are some wonderful stunts, and I appreciate how there aren’t any hard answers provided in the film. We are never told why The Car has appeared, what it wants, or where it came from. Certainly there are hints, but even our protagonist Wade refuses to believe any of it, all the way up to the final frame. This is one of the weirder movies to come out of the post-‘Exorcist’ Satanic movie craze of the 70’s.